There’s plenty of competition among mobile payments apps, but Michelle Songy thinks the hospitality sector needs a unique approach. We spoke to the co-founder of London startup Cake, which has a brand new recipe for paying restaurant bills. Songy is talking about the mobile payment app she co-founded, Cake, which I’ve just downloaded so we can share a tab for our rose-mint teas. There’s a lot of interesting things about Cake: it’s aimed at the hospitality industry, enabling diners to pay their bills directly from their phones. Cake links to the restaurant’s point-of-sale system, meaning there’s no need to wait. Where it gets even more intriguing is how the app makes it easy for groups to split the bill. Using Cake means no one will be left paying for someone who’s short on change, or having to compensate for that person who went home early but didn’t leave enough to cover gratuity. Songy opens the Cake app on her phone. Now that I’ve signed up (one minute, including adding a bank card) she can add me to her tab. Once we’re ready to pay we can each choose what we had from our bill, add the tip percentage, and then the app triggers the card payment. I deliberately waited to sign up until I was in the restaurant, wanting to see if it would still be easy with patchy mobile data coverage, loud music and potentially impatient waiters, and I have to admit: the Cake app is pretty slick, and the Cake business is well thought out. Right now, Cake is rapidly adding users, with the numbers growing 20% week-on-week. There’s only 30-something restaurants using the app yet, but the company’s in line to have 100 up and running by the end of the year. In July, Cake raised more than £1.1 million on CrowdCube, overshooting their £800,000 target. “I think crowdfundng can be really good for B2C businesses, at least if they’re not too new,” says Songy, who’s also raised money from traditional investors. “It can make people feel they’re part of a company they like.” The big push now is sales and development: “[The money is] going into raising London to the next level. That means getting more developers, and more salespeople to sign up as many bars and clubs and restaurants as we can. We’re also looking into doing a few more pilots in other countries, for future expansion.” So the order is the UK first, then Europe, and then the US. One major element still to be added to the app is table reservations, as well as a loyalty feature: “That’s probably the biggest platform we’re building for the restaurants: that they can look at their data. … They can be learning more about their customer [demographics], and spending down to an itemised level. That’s important to us: working with the restaurants and figuring out what they can get out of it.” Having said that, app users can rest assured that not every sandwich shop in town will be given your email address. Cake is still looking at the legal issues around data sharing, but the idea is to create a bespoke marketing service. Posted on 10/22/2015 by Jess. 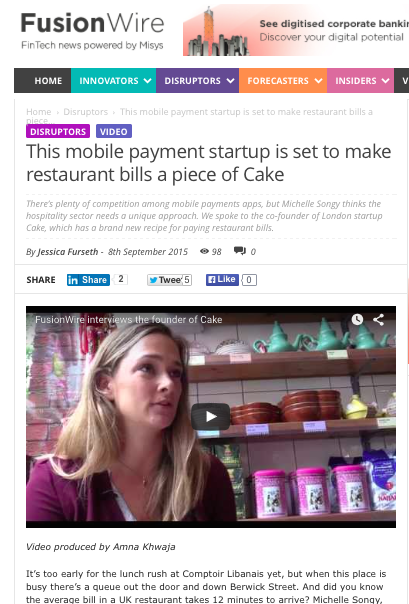 This entry was posted in Technology features and tagged cake, london startup, payment app. Bookmark the permalink.